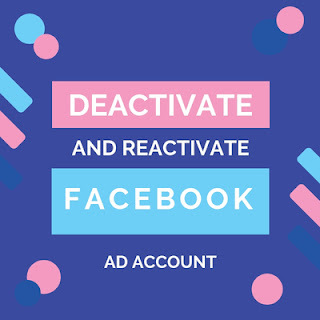 Deactivate and Reactivate Facebook Ad Account | How to deactivate Facebook Ads Account: Let's get started with how to deactivate and reactivate a Facebook ad account. This article is for everyone who mistakenly deactivated their ads account and wish to reactivate it. In this post, we'll show you how you can either reactivate or deactivate your facebook ad account on the ads manager settings page. 5. See your billing summary, payment history, and payment method info. Let's get started with how to deactivate a facebook ad account before we shall proceed to the guides on how to reactivate it. To deactivate your Facebook ads account will not a dime of your time. However, we'll first take you through the things you need to know before you can click the deactivation button. Note that the following information is about deactivating a Facebook advertising account. If you are looking for information on how to close your personal Facebook account, go here. 1. The primary payment method you used for ads is removed. 2. All of your ads stop running. 3. You won't be able to create ads using the ad account. If you want to create new ads on the ad account, you need to reactivate it. 1. Any outstanding balance on your account will be charged to your credit card. The credit cards on your account will be automatically removed after your outstanding balance has been paid. This process may take up to 2 business days. 2. You'll need to wait until your ad account is deactivated (or closed) and your balance is paid before reactivating it. To reactivate your ad account, click the Reactivate link at the top of Ads Manager. You'll be prompted to complete a set of steps before your ad account can be reactivated. 3. Before you officially deactivate, learning from successful advertisers is a great way to improve your advertising. 1. Type https://www.facebook.com in your browser and click the enter button. Next, you'll need to enter your login details and click Login at the top right corner of the Facebook homepage to proceed to your account. Note that if you've already logged into your Facebook account, you can jump this step and proceed with the below steps. 2. Go to your Account Settings in Ads Manager. You may be asked to re-enter your Facebook password. 4. You'll need to click the Deactivate Ad Account link at the bottom of the page. 5. Finally, a window will open asking you to confirm the deactivation. Click Deactivate Ad Account in the bottom-right corner of the window when you're ready. Here're the things you need to do should in case you're having trouble deactivating your Facebook ad account via the Ads Manager. Having trouble closing your account? 1. Check what your role is on the advertising account. If you aren't the admin of an ad account, you won't be able to deactivate it. 2. If you have a current balance, there may be a delay in closing your account if we're not able to successfully charge your payment method (ex: your credit card is expired). You may need to add a new payment method to pay your balance. Once your balance is paid, all payment methods will be removed and your account will be deactivated. 3. If it's been over 2 business days since you paid your balance and you still can't deactivate your ad account. 2. You can't reactivate an ad account if it has been deactivated due to a change in currency or time zone. See: How do I unblock someone on Facebook Messenger? That is how to close and reactivate facebook ad account.